The project is based on the possibilities of a form of ‘table-top’ video sculpture, part architectural model, part video installation. Four of these ‘table-top’ pieces are be arranged in a darkened gallery, each simultaneously projecting perfectly synchronised, choreographed video sequences of the interior of four related architectural spaces. Each location has been shot using a repertoire of specific camera ‘moves’. These movements were devised in strict relation to the particularity of the spaces and their features and are physically subject to the building itself. For this we had custom built two camera mounts - a three axis 360-degree pan and tilt head and a dolly or 'sled' to use balustrades or handrails as guides for tracking. With these devices the building were be literally used as the armature for a mobile camera. We were interested in architectural locations that are stylistically related, with strong linear organisation yet with distinctly different functions. We identified the work of Erich Mendelsohn and in particular the De La Warr Pavilion in Bexhill on Sea, the Schocken Department store building in Chemnitz, The Metal Workers' Union (IGM) Building in Berlin and the B'nai Amoona Synagogue in St. Louis, USA, (now the Centre of Contemporary Arts). Each of these 'signature' buildings offers the potential for treatment - curving stairways, projecting mezzanine floors etc. as well as being of significance beyond, in terms of architectural modernism, European design and European history. In addition to the three European buildings, the B'nai Amoona Synagogue, while not completing the story, more fully plots Mendlesohn's career; his origins in the East, his work in West Germany, his flight to England, and eventual residence in America. Obviously this is a story which is not untypical of that generation and that historical moment. Its significance is considerable in terms of the European influence on American art and design and the shift of a perceived centre, away from Europe, through the work of other celebrated German émigré architects such as Mies Van der Rohe and Walter Gropius. 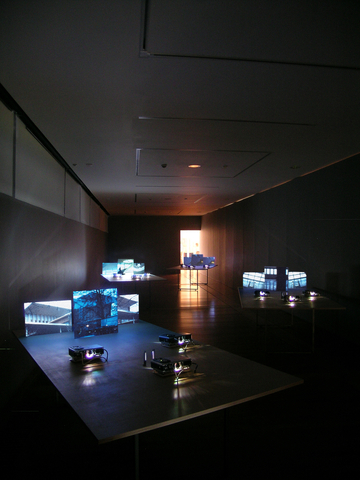 The video footage has been edited ‘across’ the three screens of each of the four table top ‘models’ to produce a fluid space in which the architecture of the building, and the experience of it, are re-drawn through the synchronised, continuous movement of three points of view, in, and across the four sites simultaneously. The work aims to construct an analogy between the serpentine fluidity of Mendelsohn's buildings, as canonical modernist architecture, the complex significance of the buildings and the ‘motion-path’ of a camera as it glides through this space. Formally, Motion Path engages with the problem of how to film a building - the relationship between cinematic poetics, that is; how to approach a building cinematically, and documentary; how to fuse the factual documentary film or the industrial film with abstract cinema? Initially we were interested in using work we had developed based on the idea of a virtual camera in a 3D computer-modelling programme. We wanted to attempt to move a camera through a real building as if it were in a digital 'fly through'. Here a number of connections can be made. Firstly; the history of architectural film and the use of film to introduce the public to modernist architecture; the idea of architectural film speaking directly to the public and generating an experience of modernist architecture that remained true to the characteristics of the building, and was perhaps even superior to the direct experience of that building (the space in it’s idealised form). Examples here would be the films of Pierre Chenal, Man Ray and Hans Richter that emphasise the dynamics of modernist architecture. Their emphasis is on movement and circulation in order to experience the building as a set of changing relationships between vistas, voids, solids and apertures. Secondly there is much academic and historical writing on the links between architecture and film, and in particular the connection between the moving, restless camera in early architectural film and the distracted gaze of the spectator of architectural modernism. Here film is seen as the ideal medium for rendering the dynamism of modern architecture and the connection between the roving camera and the mobile spectator as detailed in Beatriz Colomina's work on Le Corb and the architectural promenade are important. "it focuses on the precise appearance of individual structures. A leading German architect of the interwar period, Mendelsohn was less interested in covering the totality of the modern city than in disseminating captivating visual information. In a review of the book, El Lissitzky writes, "a first leafing through the pages thrills us like a dramatic film. Before our eyes move pictures that are absolutely unique. In order to understand some of the photographs you must lift the book over your head and rotate it. The architect shows us America not from a distance but from within, as he leads us into the canyon of its streets". The relationship to the project is striking and is one of many connections that have emerged as the project has progressed. Secondly; the ways his buildings aimed to render visible, or perform, ideological claims in terms of a syntax of use - the way the buildings were designed around the idea of a circulation and movement that is rhetorical. For instance, Mendlesohn designed the Metalworkers Union building to make visible the social and political claims of the union - the workers and union officials move through the building in a way that enacts the principles of democratic decision-making. Similarly he designed the St. Louis synagogue to render visible the idea of a community of faith, merging school with temple and community centre. The temple itself is organised around a 'spine' of light flooding from the Torah Shrine upwards and across the curve of the ceiling. The shooting, completed in December 2005 was helped greatly by the current users or owners of the buildings; Renee Dressner of the GGG (a Germany agency not unlike English Heritage in Britain), Peter Senft of the IGM (the German Metal Workers' Union) and Kathryn Adamchick in St. Louis, and Celia Davies at De La Warr Pavilion. All provided us with every practical help we needed as well extensive historical information about the buildings. In Berlin we were told a great deal about the relationship between the design and how it is intended to embody the ideological priorities of the union - the stairway in particular being the means by which the general membership moves from the street to the congress hall at the top of the building to then pass down its decisions to the offices below. Similarly the role that each building plays in the history and 'self-image' of the respective towns and cities, as well as their histories of use, reuse, decline and refurbishment, is of great interest. Much of what we were told by the numerous people we met does not exist in print, in English translation at least, as far as we are aware. It is of great relevance to the work and suggests the value of a catalogue documenting the work and presenting this research in the future. That the four buildings are either involved in or have a history of restoration, 'adaptive re-use' and refurbishment is also a very productive coincidence. The GGG in Chemnitz are yet to begin the planned refurbishment of the Schocken building, it is currently empty and suffering from its earlier neglect. The IGM building was entirely rebuilt after the Second World War (during which it was destroyed, as a Nazi Workers headquarters, by the Red Army as they captured Berlin) and is in beautiful condition. The De La Warr Pavilion benefits from a recently completed refurbishment and development, and the B'nai Amoona is currently undergoing some alterations. There is a ‘sub-textual’ importance to this ongoing process and as we have recognised it we shot the buildings with this, amongst many others factors, in mind. Each of the buildings was shot in a single day from early morning to night. We approached each of the four buildings quite differently, reflecting their very different qualities and current state. The large open spaces and gradual curves of the frontage of the Schocken building lent themselves to the use of the dolly and 360 degree pan and tilt head. A series of travelling spiral passes were made through the various levels. We also used the 'sled' mount to travel down the linear handrails of the stairways. In the IGM building we focussed on the extraordinary glass, marble and copper spiral staircase. Using the 360-degree pan and tilt head we mimicked the sinuous movement of the stairs and concentrated on the complex of reflections in the metal and glass elements as the users of the building moved from floor to floor. This use of an approach specific to each site and creating a distinct quality to each of the 'models' produced was continued in the shooting of the final location, the De La Warr Pavilion. Each of the separate ‘buildings’ has been edited as a set of three adjacent and slightly overlapping screens. 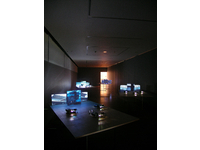 These three sets of three screens were then adjusted or re-edited in relation to one another to achieve a strict and synchronised interrelationship, or choreography between all twelve moving images. The first exhibition of the finished work was commissioned by and staged at the De La Warr Pavilion. The work is specifically an environmental installation and the configuration of the tables in the space has been the final stage in the construction of the work – through shooting, to editing and installation. The arrangement of the tables has been devised in relation to the exhibition space itself and subject to a number of specific considerations – that there be no single straight route through the space, rather that the space has to be deliberately ‘navigated’, and that there was a position from which all twelve screens could be seen (if for some only at a distance) simultaneously to allow the synchronised movement across all twelve to play a primary part in the experience of the work. The size of the screens both allows for this ‘overview’ of movement across all twelve screens but by also avoiding the risk of overwhelming spectacle, draws the viewer into their relatively intimate individual size.